It seems as if Thursday night football is almost unwatchable. I don't know why the NFL insists on having Thursday night games anyway. It doesn't seem fair to the players involved to have a short week to prepare to engage in such a brutal contest. An incident in the most recent Thursday game reminded me of football's unchangeable savagery. Miami Dolphins linebacker Kiki Alonso put a hit on Baltimore quarterback Joe Flacco that knocked Flacco out of the game and at least into the middle of next week. Flacco had to have stitches and is in concussion protocol. Alonso was penalized for unnecessary roughness, but wasn't ejected from the game. At the time of this writing, the NFL has not decided if Alonso will be suspended. I think it's likely though. The NFL has tried to cut down on helmet to helmet contact. It has tried to reduce the hits that quarterbacks take. The NFL has, compared to the bad old days of the 70s and 80s, limited how defenders can hit offensive players. We know more about the human body and brain than we did thirty or forty years ago. And people want to see scoring. When there's no scoring people don't watch the game. But all the same you can not take young muscular men between 200 and 400 pounds and repeatedly crash them into each other at high speeds without someone getting hurt. It can't be done. And as other players have pointed out, when a quarterback steps on that field, he is subject to getting hit--like everyone else. Football players are trained to play until the whistle. If they don't they won't be employed for very long. Quarterbacks have faked slides and continued to run past defenders who have let up. I'm not sure that by the rules of the game Alonzo's hit on Flacco was "dirty" but it certainly looked painful. The hit was questionable enough for Flacco's teammates and coaches to start a ruckus. Once a quarterback starts to slide he's really not supposed to be hit. That's kind of the whole point of sliding. Watch below and sound off. Afterward, Alonso said there was "no way" he could have avoided the hit. "When a guy slides, the target is very small. I just think it [Flacco's slide] was a second late, which is why I hit him, to be honest with you, "the linebacker explained, via ESPN.com's Jamison Hensley. "At first I was anticipating I thought he was going to slide. And then it got to a point where I was like, 'I got to him,' because he slid too late." That's debatable. And it doesn't help Alonso's case that he led with his forearm to the side of Flacco's head. 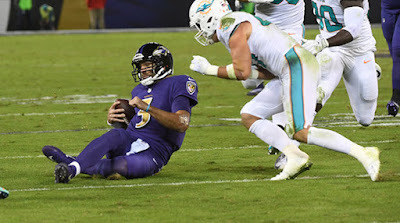 Not surprisingly, Flacco's teammates and coaches were incensed; seconds after the hit, offensive lineman Ryan Jensen knocked Alonso to the ground and coach John Harbaugh was screaming in Alonso's face before an official intervened. During the postgame press conference Harbaugh wouldn't comment on whether he thought Alonso should have been ejected.